Constructing swimming pools and spas from Los Angeles at the east interchange, continuing north up through San Fernando Valley, Ventura County, Santa Barbara County all the way to San Miguel. Also in Santa Clarita, and the Antelope Valley (see map). Is your award winning pool next? Ready to swim? This backyard oasis overlooking California&apos;s rolling hills offers a tiered raised stack stone spa. Boulder accents adorn the perimeter of stone coping. The blue-green hues of the scenic vista are complimented by the interior pebble finish. You deserve to enjoy a relaxing outdoor experience, designed and constructed by experienced craftsmen. We have an extensive history of swimming pool building that covers a wide range of design solutions including: walk-in beach entry, infinity edge, structural caisson support, and many other engineering challenges. We cater to an array of requests; from simple residential pools that a family can enjoy, natural rock pools with pebble finish, re-models, to large complex commercial water features. 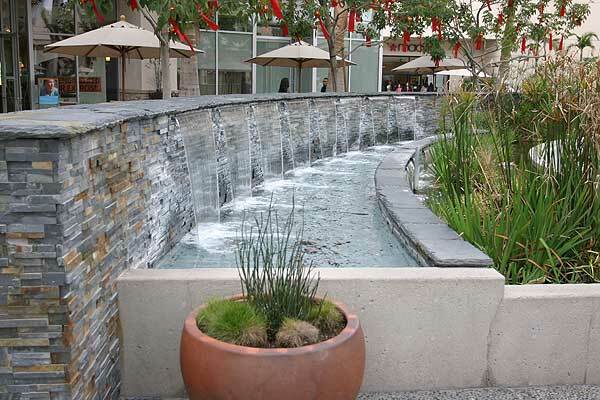 Our excellence in delivering quality swimming pools beyond expectations has allowed us to partner with some of California&apos;s best landscape design firms such as LDI and Valley Crest. We have been entrusted to construct beautiful public works at malls, community entrances, private installations at hotels and multi-housing complexes. Ventura Pool & Spa has been serving Southern California for well over two decades. Despite as our name would suggest, you will find us designing and building swimming pools from Los Angeles at the East interchange, continuing North up through San Fernando Valley, Ventura County, Santa Barbara County all the way to San Miguel. You will also find us in the Antelope Valley and Palm Springs. The true value of a new swimming pool is the joy you get by using your pool. That is why we go to great lengths to make the construction process proceed smoothly and quickly. No matter whether an economical lap pool or developing a high-end commercial water features, you get a personal experience. Work one-on-one with a single qualified builder. We have had the privilege to not only build for our customer&apos;s friends and family, but requested again over a decade later for new properties. Westfield Santa Anita Mall fountain, in Arcadia. Ventura Pool & Spa is a recognized name to various landscape design firms, large housing development companies, and prominent private contractors. We have built everything from Olympic sized pools to 90 foot long water features. We bring more than 20 years of experience to the table and look forward to the challenge of building projects that are difficult. We are completely familiar with the requirements of the various city, county, Health Departments--their regulations and the proper manner in which to submit plans with engineering for approval. Design, just as art, has multiple definitions; there is no single definition. Design is so simple, that is why it is so complicated. We take pride in our work and your satisfaction. Innovative solutions to creative challenges and client feedback is what inspires us. Every project has unique demands, whether structural or aesthetic. You will find we are genuinely interested in crafting your vision. We strive to educated and inform you on all topics of pool construction and ownership through the process. Maintenance costs can be dramatically reduced by using new equipment and alternative green energy. Pool circulation is the life-blood of your swimming pool, powered by a network of plumbing and pumps. New variable speed pumps allow you to save money by using less energy for general circulation and ramp up only when needed to enable additional water features or spa jets. While sunny California does offer year-long sunshine your pool water will not be temperate for year round swimming unless heated. You can typically expect five months of comfortable naturally heated water, but may wish to extend your swim season further. While a gas heater will be required through winter months, if your goal is to simply extend the season you should consider solar. Our solar pool heating offering is different from electrical solar panels, but similar in that they are flat panels that would be attached to your south, southwest facing roof-line. The panels are made of small tubes which water passes through. As the sun bakes the panels, that warmth is transferred to the water and back to your pool. Pool solar is economical solution for long-term pool ownership, as the system works off your existing circulation pump, you reduce your energy costs by not incurring gas heating charges—and you are reducing the use of fossil fuels. © 2019 Ventura Pools Waterfalls & Spas all rights reserved.